Special classes about science and the ILC were held at 18 junior high schools in Ichinoseki City in the 2016 fiscal year, for students to learn about the importance of the fundamentals of science and the significance of bringing the ILC to fruition. 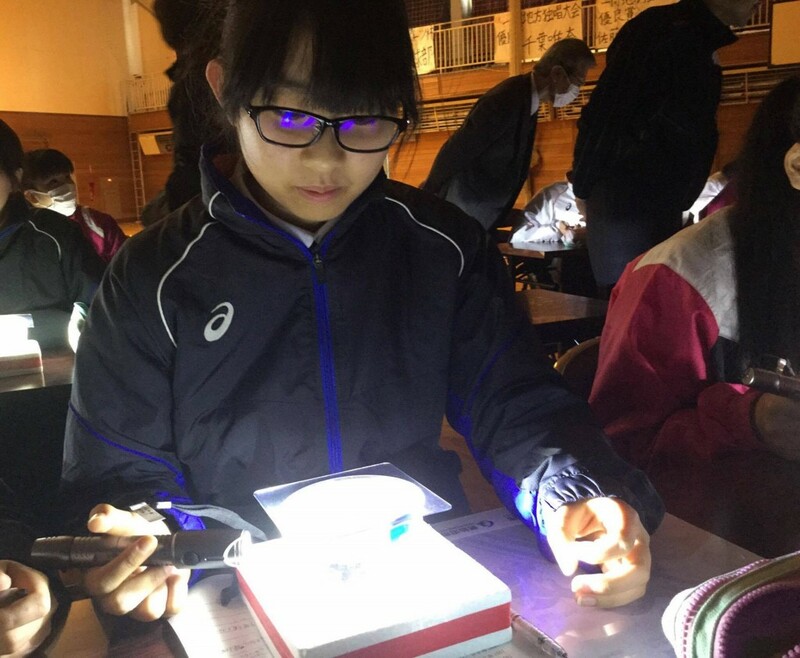 The classes were taught throughout the year by Associate Professor Junpei Fujimoto of the High Energy Accelerator Research Organization (also known as KEK), and Associate Professor Tomoyuki Sanuki of the Department of Physics, Graduate School of Science at Tohoku University. 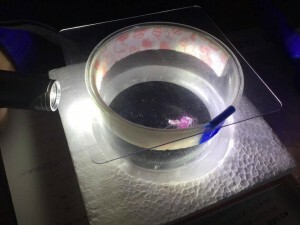 Students got to try “cloud chamber” experiments in the second half of classes, and observed clouds of alcohol vapor created in paths taken by elementary particles. A reporter from the Iwate Nippo newspaper joined the class held at Sakuramachi Junior High School in July; the following is a translation of the article the next day (from page 19 of the July 8 edition). 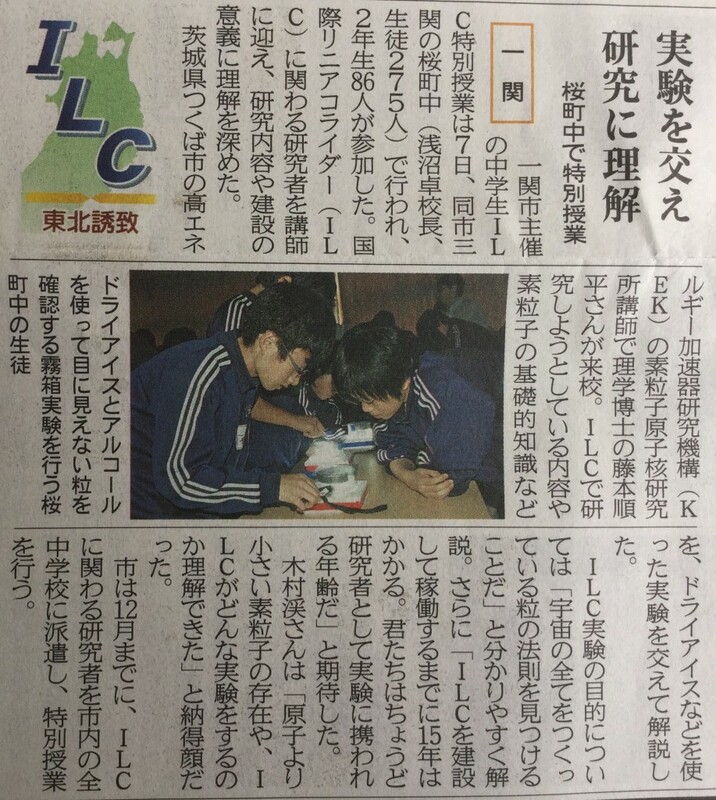 A special ILC class was held at Sakuramachi Junior High School on Thursday for the 86 students in the second grade, who learned more about the research that would take place at the proposed International Linear Collider, and the significance of building it. 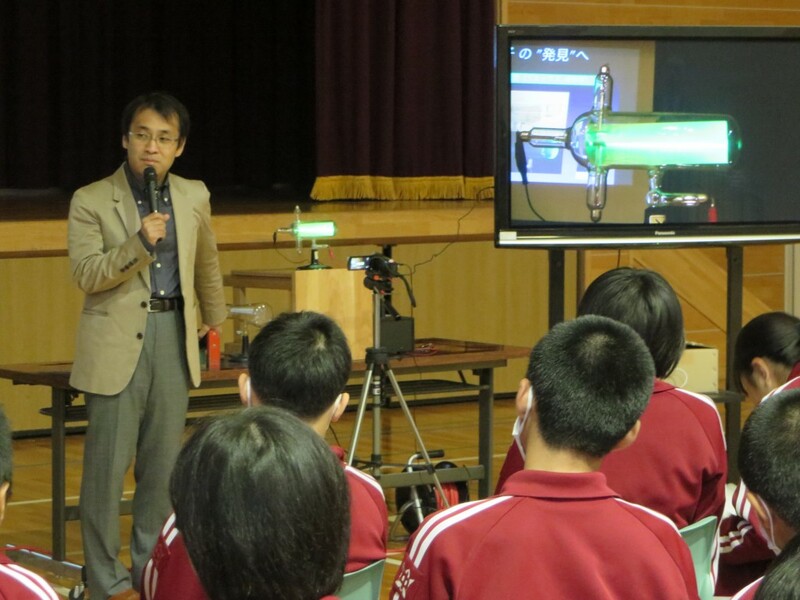 Associate Professor Junpei Fujimoto of the Institute of Particle and Nuclear Studies at the High Energy Accelerator Research Organization (also known as KEK) in Tsukuba City, Ibaraki Prefecture, was asked to speak at the junior high school, and made use of dry ice (frozen carbon dioxide) in experiments to explain the nature of ILC research and the basics of elementary particles. ILC classes are being held at all junior high schools in Ichinoseki City through to December, presented by Associate Professor Fujimoto and others involved with the ILC. [Photo] Students observe the behavior of particles invisible to the eye via cloud chamber experiments using dry ice and alcohol. Associate Professor Sanuki also introduced physics history in his classes, and made use of a “Crookes tube” to see streams of electrons. Students then tried their hand at the cloud chamber experiments. “I learned at school that atoms were the smallest units of matter, but I learned today that even smaller particles such as quarks exist. I wondered how they’d been discovered, even though no one has ever seen them. That’s researchers for you, finding things we cannot see with the eyes. “Being able to see the path (taken by elementary particles in cloud chamber experiments today) was a really valuable experience. They flew out at irregular intervals (in seemingly straight paths,) and I wondered why they were in straight lines, why they quickly disappeared, and where the particles went. ILC classes at junior high schools in Ichinoseki are scheduled to continue in the 2017 fiscal year.